This tapered fly fishing leader offers unmatched elasticity, knot strength, and suppleness and is available in 3 lengths to suit your fishing style and situation. It is the ideal all-around freshwater material. The knotted strength of SuperStrong is higher than any other polyester material, meaning when that big brown chomps on your fly, you can finish the fight without fear of breakage. With a perfectly balanced blend of elasticity, knot strength, and suppleness, SuperStrong is versatile and adaptable. 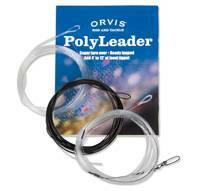 Orvis's fly fishing trout leaders are designed to turn over flies perfectly.  Sinks quicker than polyester, perfect for nymphing or throwing large streamers.  Refraction index close to water, making this leader nearly invisible to fish. 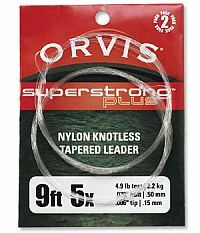  Outstanding turnover power, the result of patented extrusion taper technologyan Orvis exclusive. Some fluorocarbon leaders are blended with polyester, lessening the benefits of abrasion resistance and low visibility. 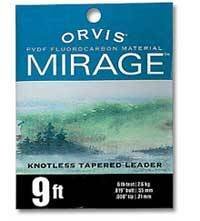 Pure fluorocarbon Mirage has the highest abrasion resistance of any leader or tippet, and is virtually invisible to fish. 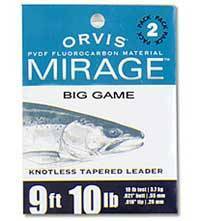 Mirage fluoro leaders are your go to for spring creeks, stillwater, large streamers, or fishing nymphs in clear water. 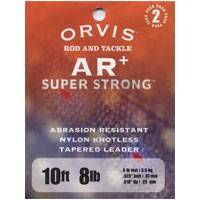 You'll enjoy the precise control you get with Orvis's fly fishing leaders. Some fluorocarbon leaders are blended with polyester, lessening the benefits of abrasion resistance and low visibility. 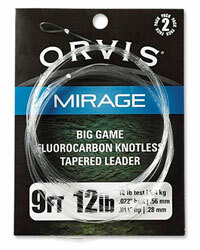 Pure fluorocarbon Mirage has the highest abrasion resistance of any leader or tippet. And its refractive index is so close to that of water that Mirage is virtually invisible. With a specific gravity of 1.76, it breaks surface tension quickly and sinks quicker than polyester, perfect for nymphing. Fluorocarbon materials retain their knot and tensile strength in water. Preferred for nymphing, especially in gin-clear waters or where fish are educated. Great for large streamers too. 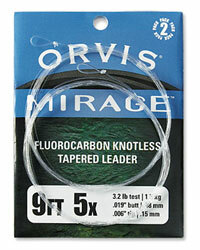 Outstanding turnover power, the result of patented extrusion taper technologyan Orvis exclusive. Improved fluorocarbon fly-fishing leaders with new tapers to give you better turnover when casting big game flies. 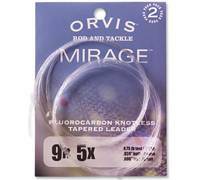 Replacement Bimini fly fishing tippets for Super Strong or braided No Knot systems. Tippets feature Bimini twist leader-to-tippet connection, giving you a loop-to-loop connection with no loss of breaking strength and excellent turnover power. 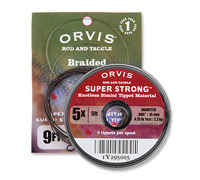 5' Bimini fly fishing tippets on a convenient spool. Tippets separate with a slight tug.